While I have been doing some research in to Tooban Junction, I had a moment which has now cost me a bit of money. Now while we may all have our own favorite bit of the Irish railway network, it occurred to me, that the rolling stock at any of the Heritage sites does not always get a fair crack of the whip as they say. At this stage it is just to get a feel for these coaches, but I hope that at some stage when I can get my hands on any drawings, I will try and pursued Allen from Worsley works to produce the basic kit in brass. I know that some Bachmann LMS coaches can fill a bit of gap, and there are a few 4/6 wheel kits out there as well. But looking at a number of UK based coaches, I do see there are some standard bits of styling which also happen to be on some of the Irish stock. The biggest thing to remember is that a lot of Irish stock was built to 9ft 6in width. So here goes another research thread, anyone like to add to the list of possible heritage coaching stock that can be adapted from existing OO scale RTR coaches, I do have a copy of Stephen and Alan's Modelling Irish Railways but like all modelling books this was printed before some of the later coaches where offered on sale, there will be some changes I am sure but for now I leave this open for discussion. Very little British stock can do anything other than the very vaguest resemblance to Irish stock. Some English LMS stuff can resemble some NCC stock, and the old Triang GWR brake third with the bowed-in ends resembles a pair of Waterford, Limerick & Western Railway brake thirds built in 1898 and withdrawn in 1955 by CIE. (One compartment too many, though). Thats about it. Worsley Works do a great range of Irish stuff, but as seen elsewhere on this site, they take a bit of skill and experience. Hi that was what i was thinking, I have now added an Airfix Auto coach body to try and make it into something which looks like a GNR(I) Railcar. I also now have another Hornby 113 railcar center coach body which looks a bit like one of the coaches at Downpartick (I have to move one of the doors and a window or two, but I hope it will look the part once I have finished it). The only thing I am not surer about is do I try and build them to Irish width?, I am not sure if the prototypes where build to a wider body width, but I will try and find out about them, I don't suppose it will do any harm if they are or not. Irish coaches were almost without exception of Irish loading gauge. The few exceptions were a handful of ex-LNWR, LMS and other British lines - carriages brought over here and re-gauged, used primarily by the NCC and GNR. It’s almost easier to scratchbuild. If brass daunts you, try plastic sheet? Give it a go, carriage building is great fun, and I've certainly enjoyed building and designing a few GNRi coaches. It's certainly better to build in the extra width to the vehicles, if you can, it is noticeable! Colin, at the risk of being accused of blowing my own trumpet, you might want to take a look at my workbench thread: Glovers Workbench. It covers a number of coach (and wagon) projects built from what were originally British stock. Now while we may all have our own favourite bit of the Irish railway network, it occurred to me, that the rolling stock at any of the Heritage sites does not always get a fair crack of the whip as they say. I know that some Bachmann LMS coaches can fill a bit of gap, and there are a few 4/6 wheel kits out there as well. Irish railways post-1860s only tended to build 6 wheel, rather than 4-wheeled coaches. Have a look at the Worsley stuff, but also regarding drawings, the "New Irish Lines" magazine (Allen Doherty) has had drawings in the past - I think - but has certainly had very interesting articles on Irish model carriages. Look at the absolutely superb work, for example, of Colm Flanagan. When I started this thread, I didn't have to hand the book on the Dublin and South Eastern Railway by Ernie Shepherd and Gerry Beesley. Even if you don't have a copy, it is worth getting even if it is just for the drawings in the back of it. It only arrived today, so I can't give a fair review but it looks good on first viewing. 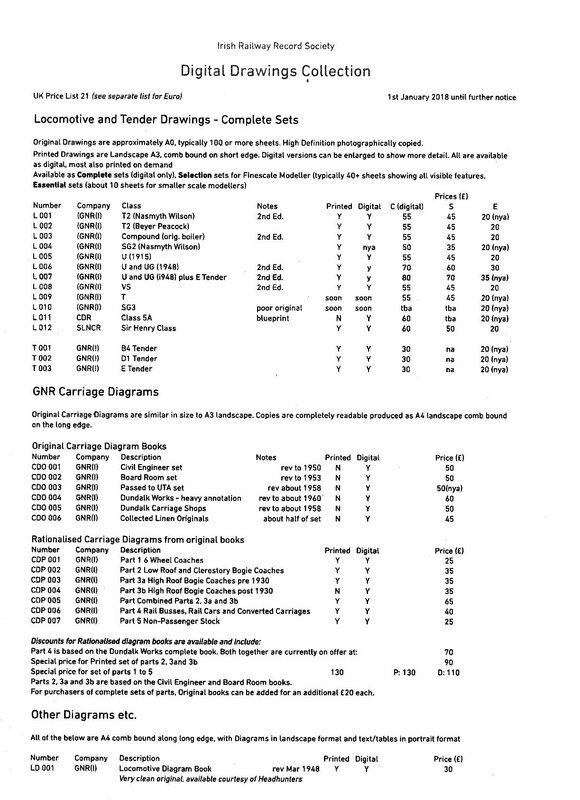 One of the biggest problems for rolling stock is locating accurate drawings or details to which to build from. I think some one on here said that a load of drawings where transferred over to the IRRS. A lot of models will be at best, guesstimates, but at some point I hope the information that the IRRS has will be made available. Hi Glover, yes I will have a look to see what you have been up to, I don't think you can have enough rolling stock to be honest, but cattle wagons are a must, but just how many I should get, well that is another matter. As I understand it the British Government decided to standard the various sizes of Cattle wagons in the latter part of the 1800's so you could end up with small, medium or large wagons. From what i have so far found out Irish Railways used mainly the Medium and Large wagons, the small size ones where those based on railways such as the Tralee and Dingle and the other Irish 3ft gauge lines. This came about due to the poor conditions that the cattle traveled in and this was changed manly by the complaints from the Irish cattle drovers at the time the cattle arriving at market in poor condition and thus they could not get top dollar for the animals, it was the threat of a strike and refusing to take the cattle by railways into London that got the standards approved. Hi Richard, sadly I am not this year, as I am working that weekend. But I do need to contact them regards rolling stock drawings, I know they where working on some of the GNR(I) stuff a couple of years ago. I am at the moment trying to contact the HMRS regarding the Cork, Blackrock & Passage Railway rolling stock drawings Worsley work do most of the carriages except the 3rd class saloon (2 compartment type) and the 1st class saloon Brake which had a Brake section, one compartment and then the rest taking up a 24ft saloon section. 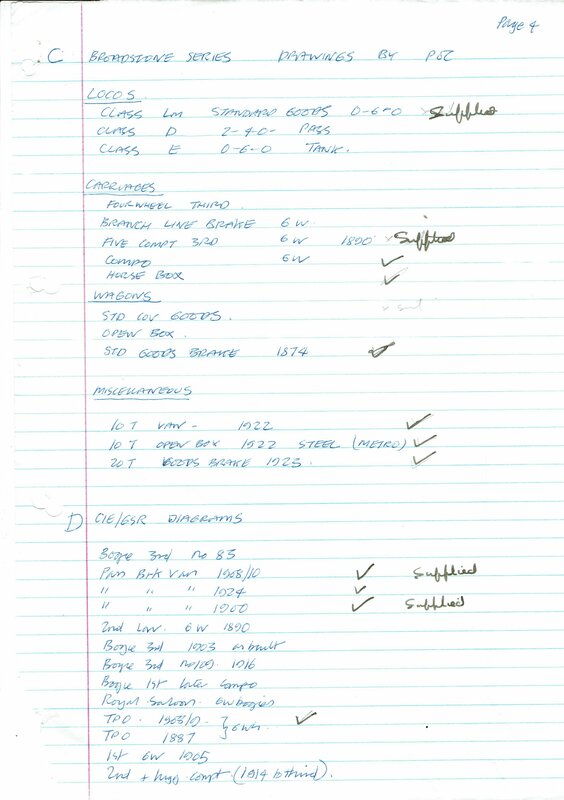 The diagram books as scanned in will be just up your street. I've been amazed by the quality of the scans; some real gems! Thanks Richard, I do need to contact them again to see what they have narrow gauge (3ft) wise, there is a lot of interest in the larger gauge from a few well established 009 modeller's at the moment, it would be a pity to put them off just because it is so difficult to find any information. The Ulster Folk & Transport Museum have loco and rolling stock drawings from the majority of the Broad and Narrow Gauge railways including GNR(I), NCC,(broad & narrow gauge) BCDR, DNGR, CDRJC and UTA that operated in Northern Ireland. I don't know if the drawings are available to members of the public, but it would be worth while contacting the curator to check on the current position. 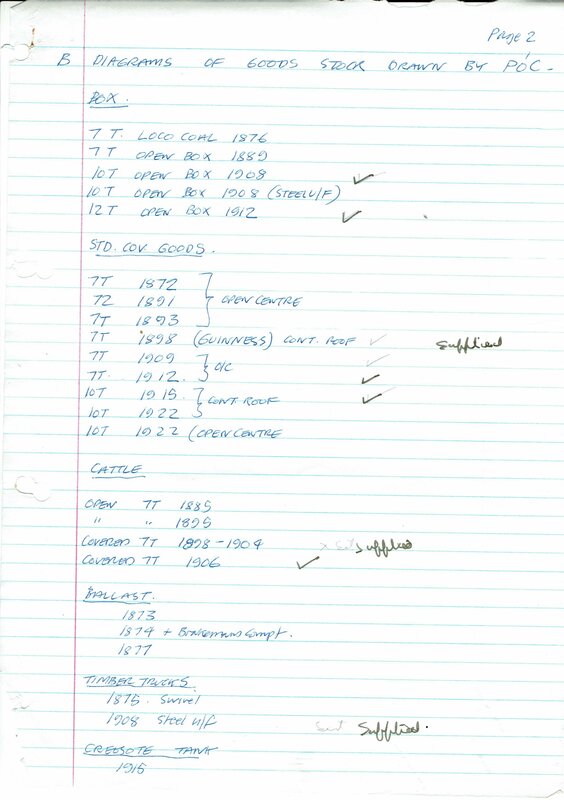 I have a copy of a 21 page catalogue I got from the museum several years ago, the GNR(I) section contained 87 diagrams of coaching stock and a similar number of freight stock, but no locomotives. CDJR, NCC, BCDR diagrams covered locos and stock. UTA drawings naturally covered railcars and railcar conversions. The diagram book contains 59 Diagrams of Bogie stock, 40 diagrams of 6w stock, 13 diagrams 4w stock (non passenger coaching). Richard Chown relied heavily on manufacturers drawings for his 19th Century locos and rolling stock used on Castle Rackrent. 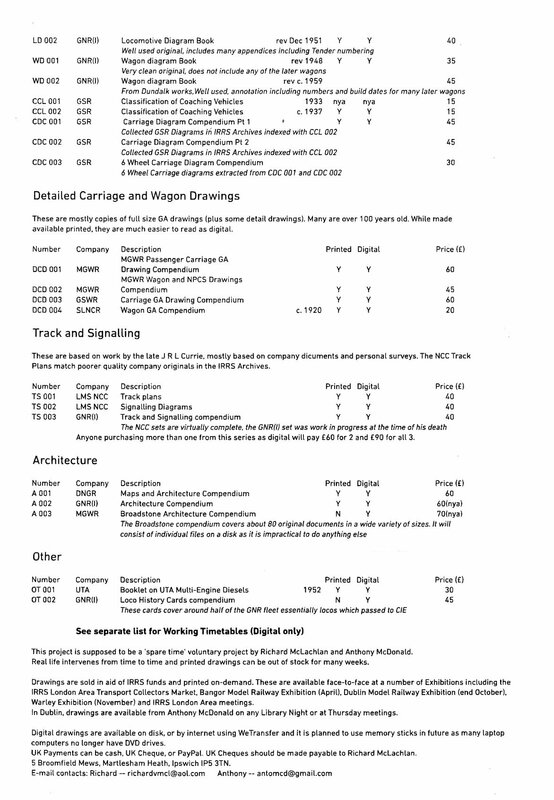 UK technological museums like the NRM, Manchester and Newcastle may have original general arrangement and construction drawings for narrow gauge stock supplied by companies like Pickering, Metropolitan Carriage and Wagon. I too have the UFTM list of drawings, obtained many years ago. Since then I have obtained many of the drawings by contacting Mark Kennedy at the UFTM, and he kindly supplied the drawings required for a small remuneration per drawing. I also managed to arrange a visit to the UFTM archives, where I was able to search through the drawings collection, and obtain copies of drawings that were not on the list. 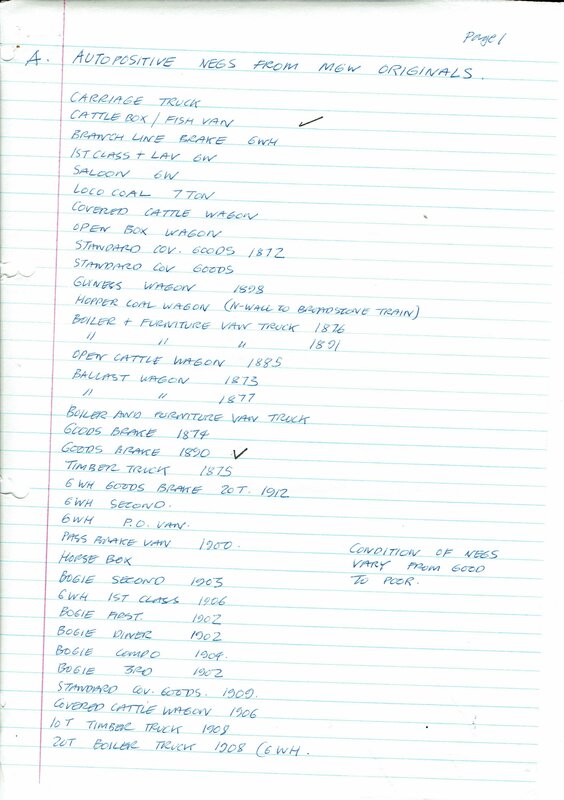 Hi guys thanks for the information, yes once the location is known it is much easier to find this stuff, I have been in contact with the Walker Bros archives sadly they are not available at present but the curator does have my details if anything should turn up, he is hoping to get to the railway record section some time next year, but it is like everything else, ie the lack of money to pay for the people to sort out the collection, i got the impression that there is only one or two people looking after the walker archives. Something I forgot to say was that Allen from Worsley Works was only too happy to produce kits if he has access to accurate drawings. 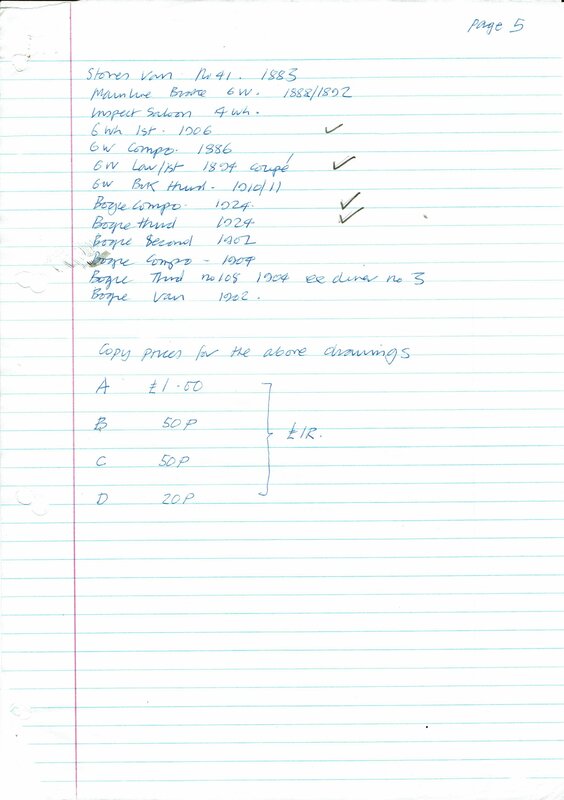 Well done Eoin that is great, there looks like a great deal of information on there. The late Padraig O'Cuimin was the recognised authority on the Midland Great Western and published papers on MGWR coaching and wagon stock in the IRRS Journal in the early 1970s. The paper on wagon stock goes into considerable depth on the evolution of both the "standard Irish convertible wagon that carried both livestock and general goods and the evolution of the Irish Cattle wagon. Basically the railways were forced by the Government to increase the length of convertible and cattle wagons to 14' in the late 19th Century which remained the Irish standard until CIE introduced the longer KN wagon in the 1950s. The GSWR & GNR had large fleets of 14' cattle wagons. The MGWR was a thrifty railway and had a relatively small fleet of cattle wagons, relying on the convertible wagons to handle traffic peaks from the big cattle fairs in the West of Ireland, rather than a large fleet of cattle wagons that were only used occasionally. Unfortunately I don't have the full collection, I will scan and post the drawing marked with a √ to the resources section of this site. 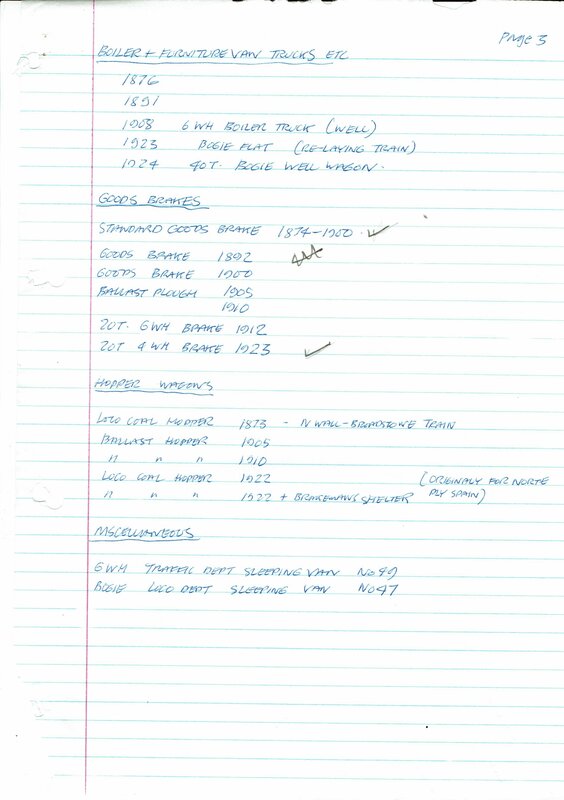 1993 prices quoted by Padraig! The Broadstone Series drawings were AO sized, unscaled, highly detailed and a work of art. Your not kidding about them being works of art, both of them would make great kits or models, I don't suppose you fancy spreading your wings a bit and having a go at making a kit from them? They would go very nicely with an upcoming loco kit release, me thinks. PS I wonder where all the original drawings are now? I bought the "MGWR Compendium of NPCS & Goods Vehicle Drawings" at the Raheny show. Very nice images and good information. Some of the originals were very faded so some dimensions can be difficult to read but these are the exception rather than the rule. One of the images is of a Passenger, Luggage and Brake Van - Branch line, which I'm drafting up at the moment. It is 30' six wheeler with raised central brake compartment. Hopefully the drawing will provide enough information to build a model. These compilations are really nice and detail is good; I can recommend. Hi Ken do you happen to have the contact detail of who produce the book? As I would love to buy a copy. My contact is Anthony Mc Donald - both his details and Richards are as per the attached image. I elected for the digital download which, for me are a bit more flexible - you can zoom in and out rather than using a magnifier! DOH!!!! sorry Ken, I didn't think about crossing the Tees and dotting the I's. Its great that all this information is now getting out, I am sure that given most of the UK Market has been swallowed up by three or four model manufactures, Irish railways must have some appeal to these companies. MGWR 6w coach kits are on the to do list, I need a couple of trains for my own use. I released kits for the 1889 Horsebox and Meat/Fish Van 3-4 years. The frets for the Horsebox and Meat Van are available to order, most of the castings are available from Dart Castings in their MJT range. Drawings of the MGWR brake 3rd, 4 compartment composite and 5 compartment 3rd appeared in Tim Cramer's series in Model Railways magazine in the mid 70s the composite & 3rd were drawn to 4mm scale but the brake 3rd appeared to be closer to S Scale! I was wondering about that, I have a few of the drawings from that Tim Cramer's series, I am never to sure if I have missed out on any of them, I am pretty sure that no one has a kit of any of them at the moment, but I may well ask Allen at Worsley Works to do something. While I am OK with that side of things, it is finding the suppliers for all the detailing bits which can take some time to achieve. PS if you are planning to do them, then I will hold off asking, since I personally have more than enough kits to build at the moment.